Simon Pearce is what the reason we originally planned our trip to this area of Vermont. Can you believe we almost kept driving right by it because we were full from samples? That would have been a BIG mistake. 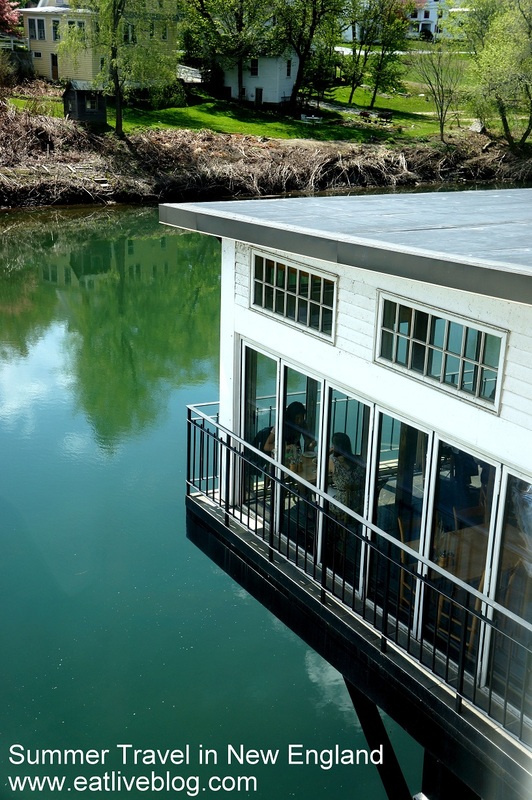 An internationally renown glass artist that has a studio, which has a restaurant, which over looks a dam and covered bridge on the Quechee Gorge? How could you pass that by? If we had kept driving, we would not have walked into the impeccable studio with high, lofty ceilings, all wood ceilings, floors and accents, and adorned with the Simon Pearce amazing art collection. If we kept driving, we would have never sat in the beautiful dining room, eaten off of the Simon Pearce design plates, and we would have never been waited on by one of the best servers I have ever had, Michael. I was mesmerized by the Vermont Cheddar Soup from the second I laid eyes on the menu. So soup and salad it was! Hands down, one of the best cheese soups I have ever had. Complimented by carrots and onions, this soup was all cheese. None of that masking the cheese flavor with nutmeg here! Pure cheese, and pure perfection. And of course perfect to dip more of the house baked bread in! Debbie ordered the most popular dish on the menu, the sesame seared chicken w/ spicy apricot dipping sauce, pickled ginger and noodle salad. The description of this meal does not even do it justice. Michael made sure to describe it in full detail, and it lived up to his hype. The chicken was crispy and laden with sesame seeds. The sauce was sweet with just a touch of heat. Even the noodle salad, which is usually not a favorite of either of us, was completely gone when they cleared our plates. This is a dish worth driving to, and maybe one of my favorite brunch meals ever. Had the rest of our trip to Vermont been a bust (which it clearly was not), our brunch at Simon Pearce alone made the trip worthwhile. Full and happy, we headed to King Arthur Flour for some shopping, a perfectly foamed cappuccino, a super fudgy brownie, and an almond cookie to die for. After all this eating it was time for some walking…. 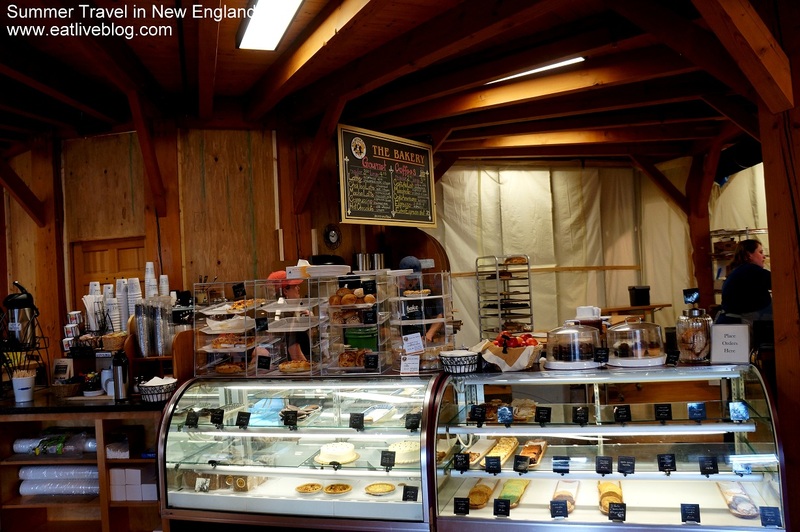 This entry was posted in Reviews, Travel in New England and tagged Brunch, king arthur flour, new england, restaurant, review, simon pearce, Vermont by reneeh. Bookmark the permalink. I have yet to go to Simon Pearce. Did you pick up any beautiful glassware while you were there? I didn’t….but I definitely have a few things on my list to register for! Yay! I’m glad you didn’t pass it by. I had an amazing lunch there. I got a spinach salad, which sounds boring, but it was the most amazing spinach salad… so much thought and detail went into it. I’m looking forward to going back in Sept for my friend’s rehearsal dinner. I figured out that nothing there is boring. Even iced tea was exciting! Love it!!! I can’t wait to hear how your dinner goes! I am sure it will be nothing short of wonderful. I had the cheddar soup there too! Their desserts are also pretty spectacular. I have not been to Simon Pearce since I was a kid. My parents were big fans. Bentley’s in downtown Woodstock is another one of my favorite area spots. so jealous of this trip! Bentley’s will be featured in my next post in this series! It was great! You always have the best travels. The King Arthur Flour store is fantastic. I miss having it within driving distance as I definitely stocked up when I was there years ago. High lofty ceiling and wooden floor is some thing that I too like. The apricot iced tea looks good.